A mammoth procession was convened to commemorate the 151th birth anniversary of Swami Vivekananda at Vallioor on 11th January 2014. The procession started at the waving of flag by Mananeeya Hanumanthraoji, Treasurer, Vivekananda Kendra, Kanyakumari Vivekananda Kendra Vidyalaya Correspondent Shri. S.K. Subramanian was in the forefront. The procession started from Thiruvalluvar Kalai Arangam and ended at Vivekananda Kendra Vidyalaya which went through Perumal Koil, Radhapuram Main Road and Vallioor Main Road. The children’s band music was superb. The students in the attire of Swamiji attracted one and all. Swamiji’s inspiring thoughts and slogans were highlighted and echoed at the procession in which nearly 800 students, parents and public participated eagerly. Vivekananda Jayanthi was observed on 12th January. The combinations of three celebrations (Vivekananda Jayanthi, School Annual Day, Opening Ceremony of New Gateway in memory of the 150th Birth Anniversary of Swami Vivekananda) celebrated together. Dr.R.Ponmurugan,Principal,T.D.M.N.S.College, Kallikulam was the chief guest. Su. Nivedita,Vice President of Vivekananda Kendra, Kanyakumari graced the function with her presence and blessings.Su. Aparna Palkar, All India Vyavastha Pramukh, Vivekananda Kendra, Kanyakumari, Mrs. Ponmurugan were the special guests.Mrs.Ponmurugan inaugurated the function by lighting the lamp. Su. Nivedita didi opened the memory Gateway. Speeches on the greatness of Mother Bharat, Views of Swami Vivekananda on Mother Bharat, aim of Vivekananda Kendra and duties of us to be the good citizens of our nation etc. were presented by the dignitaries Rs.10,000/- awarded to the top scorer in std XII (C. Sathya) by Dr. Muthukrishnan, Eswari Nursing Home, Vallioor in the memory of Dr. Lakshmanan. The prizes were distributed for the outstanding performance of the students in the last academic year. 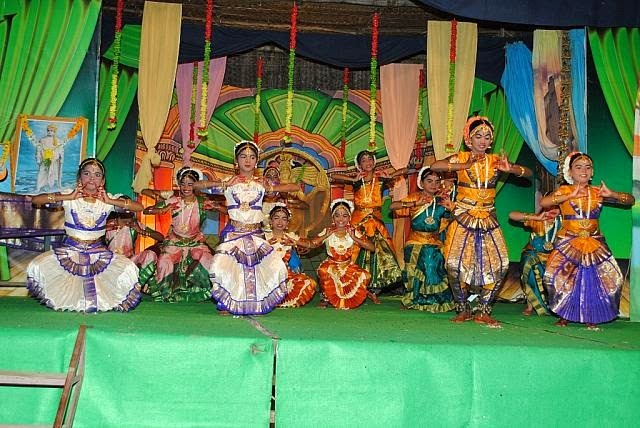 Varieties of programmes like drama, dance, yoga, karate, slokas, patriotic songs, skit etc. performed by the students exposed their efficiency. Our correspondent Shri. S.K. Subramanian organized the function.